Even (or perhaps especially) within the most well-ordered lives, the urge to break bad can be simmering just below the surface, waiting for the right wrong person to come along and provide the necessary stimulus. For Sharon, a staid Iowa divorcee in “The Roommate’’ — Jen Silverman’s shrewdly observant comic drama of midlife awakening, now at Lyric Stage Company of Boston under the direction of Spiro Veloudos — that person is Robyn, a lesbian slam poet from the Bronx. Both women are in their mid-50s, but that seems to be where the resemblance ends. Robyn has an outlaw sensibility, a complicated past, and a few secrets to conceal, while Sharon seems like a play-it-safe type all the way. But her long-stifled taste for adventure is set free not long after Robyn (Adrianne Krstansky) moves into the large, tidily well-maintained house in Iowa City that Sharon (Paula Plum) owns, complete with flowered wallpaper and a kitchen sampler inscribed “Bless Our Nest.’’ Things will never be the same in that nest. Obviously it’s not stop-the-presses news when a playwright throws two opposites together in the same household, generates sparks from their collisions of temperament, and allows audiences to judge how much one influences the other over time. It’s been the foundational conceit of many a comedy, from Neil Simon’s “The Odd Couple’’ to “Grace and Frankie,’’ Netflix’s quirky gem. “The Roommate’’ goes down a couple of other overly-well-trod paths. When you’re watching a scene of uptight Sharon trying pot for the first time and shedding her inhibitions, and you start to wonder where you’ve seen that before, the answer is: Everywhere. 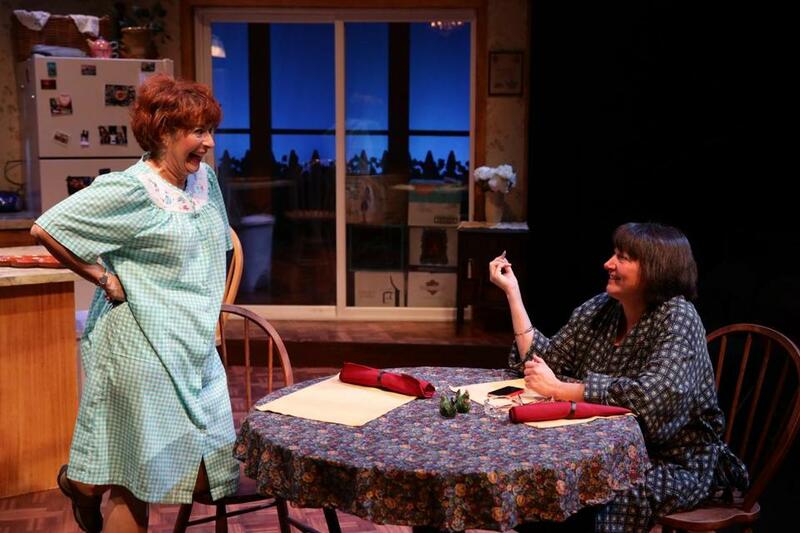 But if “The Roommate’’ does not entirely avoid the pitfalls of predictability, Silverman amply compensates with humor that emerges organically from the personalities of the two women yet does not erase the darkness around the play’s edges. On the strength of their consistent excellence and their chemistry as a Vermont couple in SpeakEasy Stage Company’s 2010 production of Annie Baker’s “Body Awareness,’’ the pairing of Plum and Krstansky shaped up as a potential dream team. And indeed, Plum’s portrait of Sharon is a vital and vivid one at every stage of the character’s evolution. But Krstansky delivers an uncharacteristically off-key performance. What emanates from Krstansky’s Robyn is a case of the jitters without the necessary layer of mystery. Her portrayal lacks the swagger and charisma that would explain why Sharon would be so captivated by Robyn that she would venture way, way out of her comfort zone. (The reason was crystal-clear in a July 2017 production of “The Roommate’’ at Williamstown Theatre Festival, starring S. Epatha Merkerson as Sharon and Jane Kaczmarek as Robyn.) The contrast is simply not sharp enough between Robyn and Sharon, which has the effect of throwing off the balance of the play. Plum, though, always seems to be reacting in the moment and always makes that moment seem fresh and spontaneous. Even the pot-smoking scene is rescued by her comic gifts. Plum can pack more into a single line than most actors can in an entire soliloquy. When Sharon, on the phone with her son, says of Robyn that “She’s an interesting person,’’ Plum cracks your heart, just a little bit, with the depth of yearning she evokes in that single adjective, and you sense that Sharon has been waiting her whole life for somebody, especially herself, to be interesting.